Casalini (Costruzioni Mecchaniche Casalini, Casalini later Giovanni) was a brand of scooters, mopeds and motorcycles based in Piacenza. The factory which began in 1958 with the manufacture of small scooters and later, they also did mopeds, motorcycles and light delivery vehicles. From 1960 they were produced under the name David a motorized transportation three-wheel motorcycle. This had a chain driven with a steerable front wheel. This wheel had both a screw and a torsion leaf spring rear suspension. 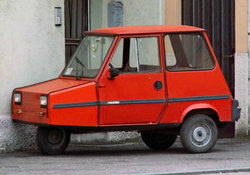 The first scooter was called the David Casalini.